About the Author: C. C. Hunter is the New York Times bestselling author of over thirty-five books, including her wildly popular Shadow Falls and Shadow Falls: After Dark series. In addition to winning numerous awards and rave reviews for her novels, C.C. is also a photojournalist, motivational speaker, and writing coach. In February 2018, Wednesday Books will publish her contemporary young adult and hardcover debut, This Heart of Mine. 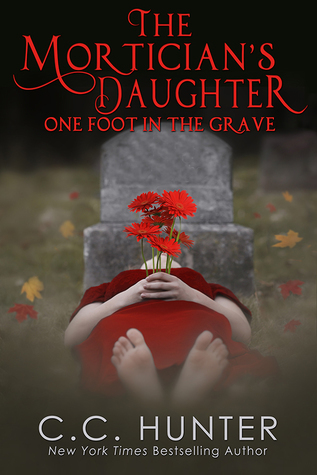 And the first book of her new paranormal young adult series, The Mortician's Daughter: One Foot in the Grave was released on October 31st 2017. C. C. currently resides in Texas with her husband, junkyard dog, Lady, and whatever wild creatures that meander out from woods surrounding home. Noteworthy experiences while reading this book: The characters! I seriously love them. They feel so real. Check out author's other books or related books? Yes try her titles The Shadow Fall series its fantastic! Recommend this book? Yes! A million times yes!! Notes and Opinions: I was so upset when she ended the Shadow Fall series but I freaking love this book! When I reached the end, I felt lost. Like what am I suppose to do until the next book? CC Hunter write such strong female characters. Riley is who aspire to be like. Not afraid to do anything or get her hands dirty. Grief seems to be a huge focus in this book. She's also got to guys on her radar. One is not who he seems. How will she deal with being in love with them both? So excited for book 2! !